Today we took a “break” by not riding our bikes. Our legs are pretty tired from the climbs of yesterday’ we hope a day of alternative activity will help them grow stronger. 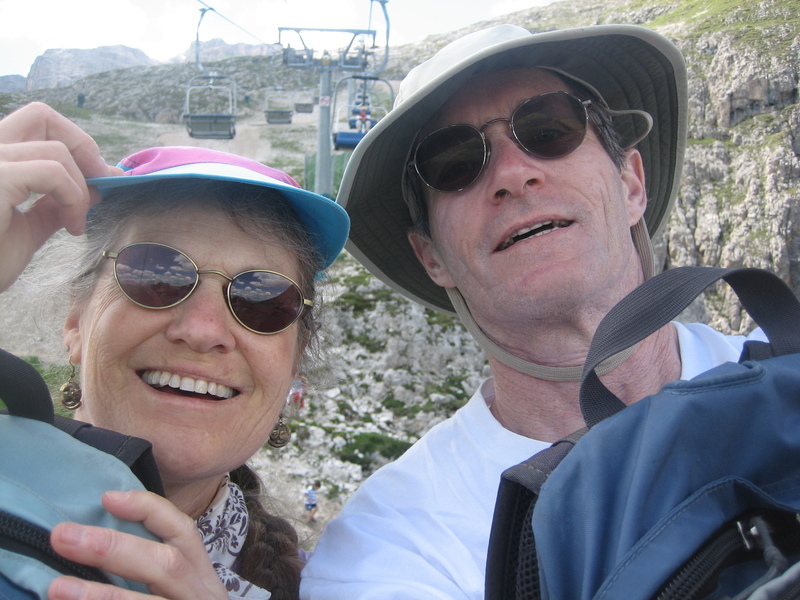 So we slept in a bit, walked across town, and rode up the Boe gondola and Valun chairlift to about 2700 meters on the eastern flank of the Selle Group. As expected, the views are stupendous in all directions. 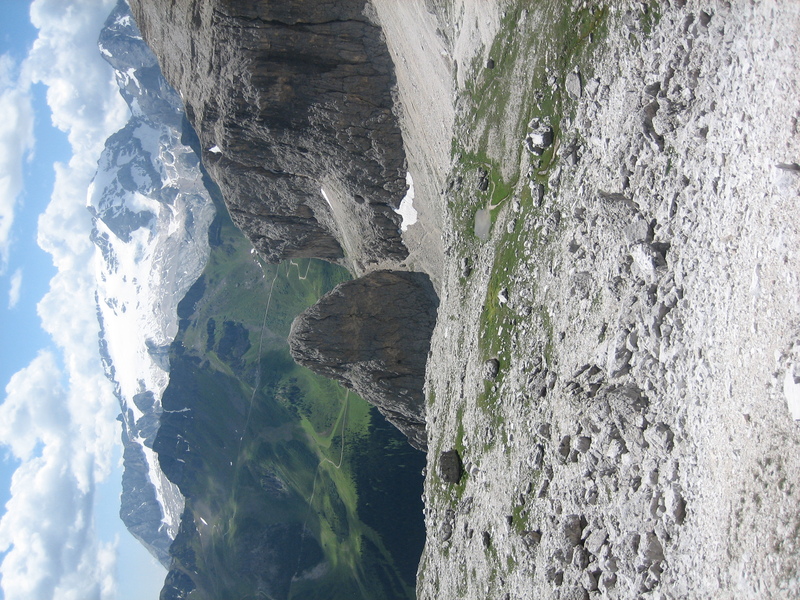 The wall that is the upper masiff of Piz Boe towers above to the west, the Marmolada with its glacier dominates the south, Toffana is close on the east, with many other peaks in the distance. 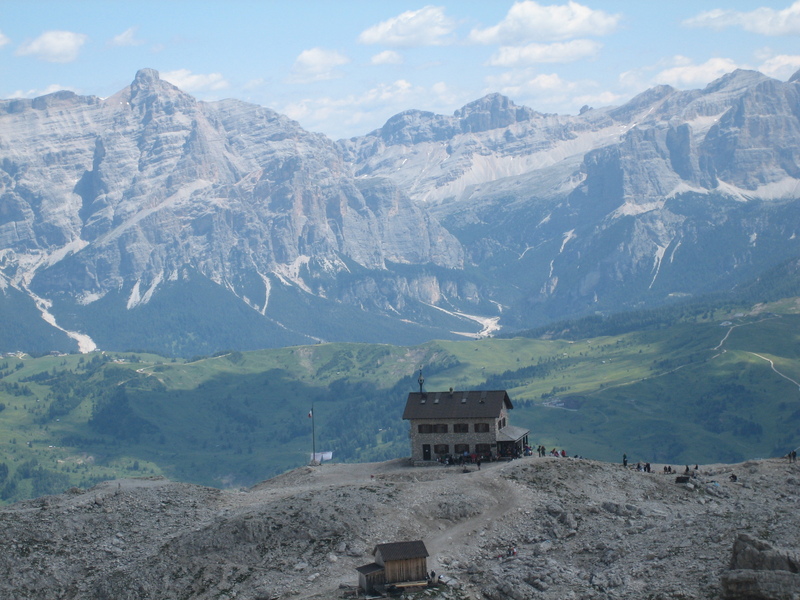 First we took an apple strudel and espresso break in the Franz Kostner hut, as the hoards of tourists gathered about us. It seemed there were three dozen teens in a large group that had hiked up from below, and countless families and older couples. 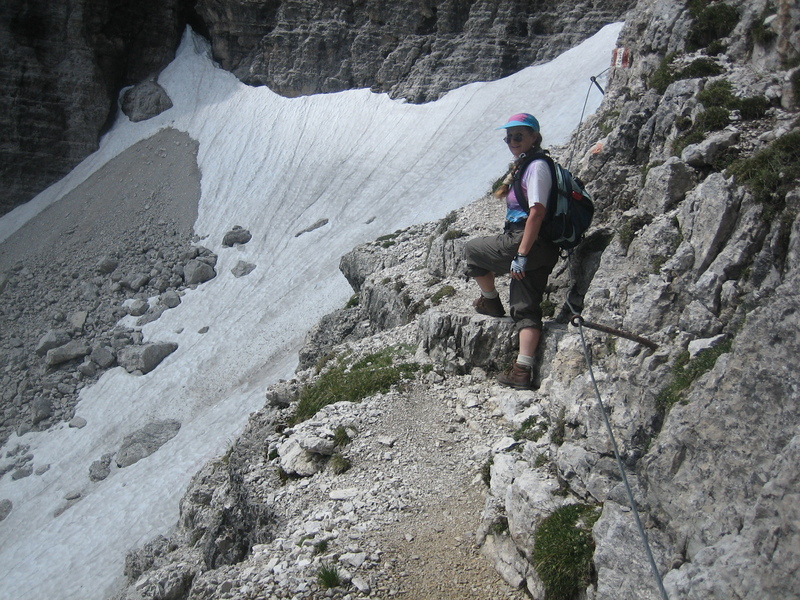 Soon we were above the hoards, hiking to see the routes above toward the peak. The most direct route rose in a spiral up a gully of scree, then worked onto the rocks above. 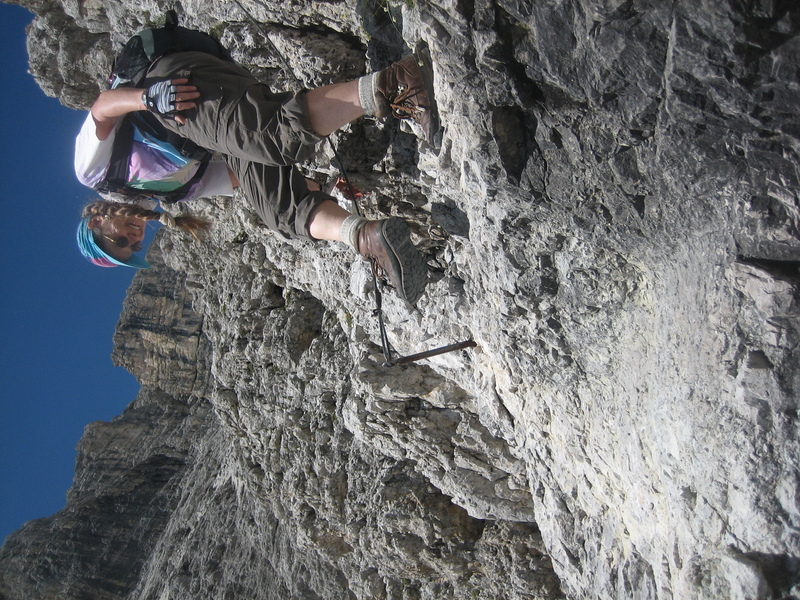 Via ferrata! 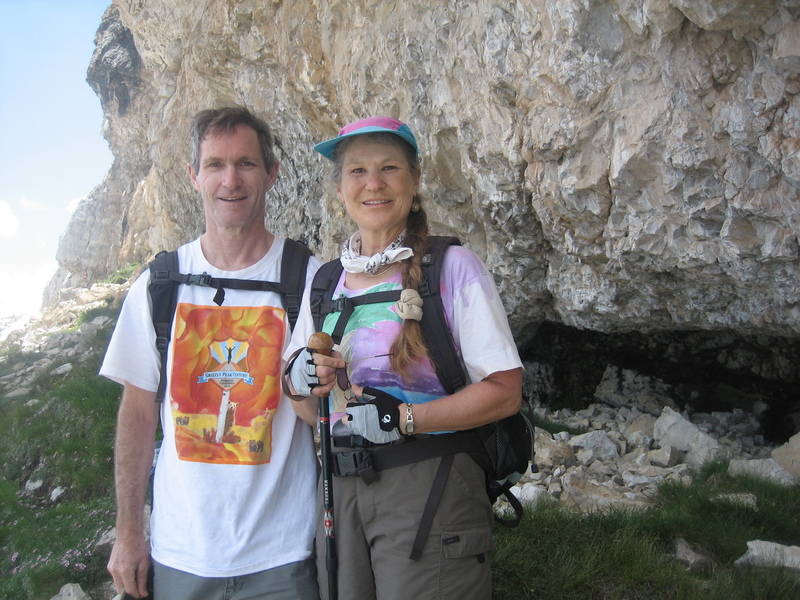 Sherie and I had discovered one of the Iron Way routes that used steel cables to provide some security on the Class 3 rock. Fairly easy big rock steps led up, and we climbed maybe 50 meters onto the rock. It was enough to see that it steepened a bit above, and went for quite a ways. Ben feared that Sherie’s sore knees and slow downhill pace might make it a very long day if we continued, so we climbed down carefully before the day could get late and we potentially miss the last rides down the lifts. Down to the trail again, we traversed on the trail to the south on the slope just under the summit towers. Beautiful meadows and widflower gardens broke up the scree slope, as the views down and away changed with each step. After a km or two, we stopped to snack on chocolate and water before returning to the chair. The view riding down rewarded our efforts. We lunched on pasta and local wines, chatting with the Canadian hikers and their guide from Bolzano. 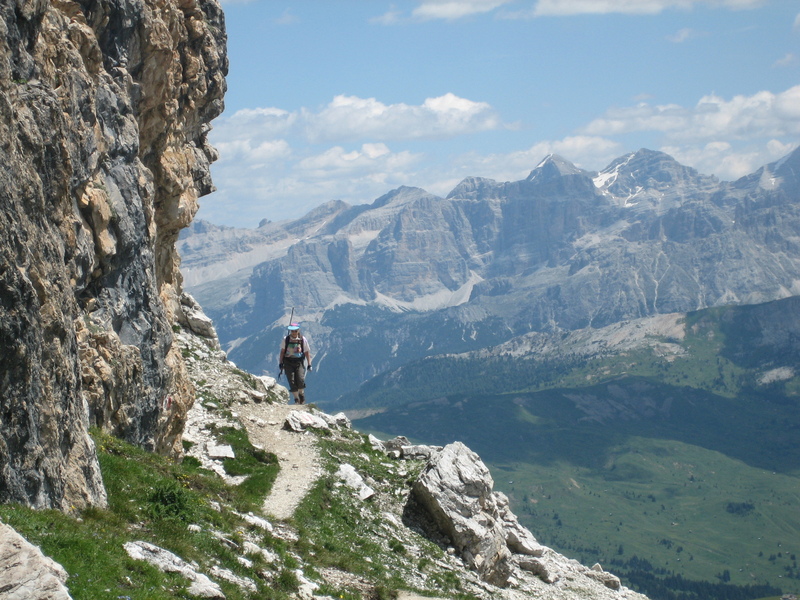 They had summited Piz Boe, up the ferrata, and shared great enthusiasm for the place and its sporting opportunities.